In February, 2009, Google released Google Earth 5.0, which included the new 3D Mars feature that we've been working on together for the past six months (and talking about for far longer than that). This was the largest joint development effort between Google and NASA yet, including about a terapixel of imagery and hundreds of thousands of KML elements. But most excitingly, it’s Mars in 3D on everybody’s desktop! The screenshot above shows Candor Chasma. My favorite feature of Google Mars 3D is actually one that most people don’t find very interesting, but that I know planetary scientists will find invaluable. 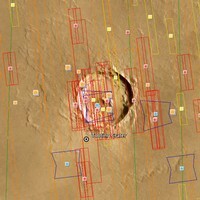 If you turn on the various layers in the Spacecraft Imagery folder, you can browse all of the images that have been taken by the five major Mars orbital telescopes. For example, the screenshot at left shows the footprints of all of the images around one particular crater. Each of them contains a thumbnail image and a link out to the raw data, along with all of its metadata, that scientists can download to do more processing and analysis on. Of course, there’s no shortage of fun, visually stunning, and educational material for non-scientists as well. The MER rover tracks, including full-resolution panoramic images taken by the rovers at various points along the way, are particularly fun. Those are made all the more impressive by the ultra-high-resolution terrain data they’re overlayed on top of. Try zooming into one of those panoramas and using the transparency slider to fade between the panoramic photograph and the 3D rendered view. It’s pretty impressive, if I may say so myself!